A man was shot by armed officers during a dawn raid that led to six people being arrested, police have said. Officers injured the man in the arm, after they forced entry to a house in Birmingham at about 05:00 BST, West Midlands Police said. Four men and two women were arrested and a firearm was recovered during the raid in Shepherds Gardens, Edgbaston. Police said the man who was shot was taken to hospital with non-life-threatening injuries. The matter has been referred to the Independent Office for Police Conduct (IOPC), which said it had sent investigators to the scene following the "pre-planned police operation". In a statement, the IOPC added that initial information suggested a single shot was fired by an officer who was searching for a man wanted in connection with a firearms offence. The man who was shot was in his 30s, according to the IOPC. Image caption Police were taking part in a "pre-planned operation"
All those arrested remain in police custody. 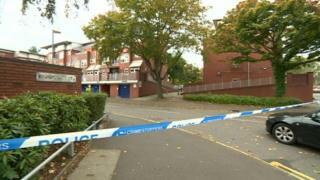 Police said the men, aged 21, 35, 45 and 52, and women, aged 59 and 64, are from Birmingham. The recovered firearm has been sent for forensic examination. It is the first time someone has been shot by West Midlands Police since Sharif Cousins was injured in July 2017, the IOPC said. Mr Cousins said he was unarmed with his hands up when he was hurt. Before then, no-one had been shot by a force officer since 2000, police said.